Chelsea, who can still qualify for next season's Champions League by winning the Europa League, are three points ahead of fifth-placed Arsenal - who have a game in hand - after a third successive league win. On a day fresh reports circulated about Hazard moving to Spain's capital, the 28-year-old produced a breathless performance to show why he is one of Europe's best forwards. 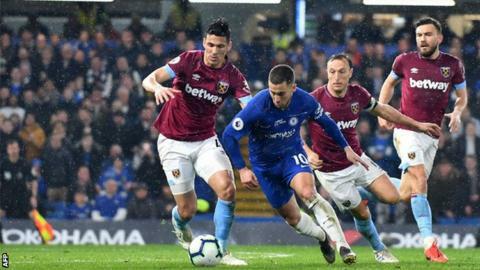 In the space of a few first-half minutes, Hazard scored his 15th - and arguably best - league goal of the season, produced a wonderful pass which saw Higuain hit a post, and appeared to be fouled by Austria forward Arnautovic inside West Ham's penalty area. To the bewilderment of Hazard and Chelsea, referee Chris Kavanagh waved away the home side's appeals. Hazard's opening goal was beautiful, the Chelsea player receiving the ball just inside the Hammers' half before using both feet during an unstoppable run which ended with the ball in the net. His second, a powerful low finish, sealed a deserved win for Maurizio Sarri's side. Hazard's contract expires in the summer of 2020 and Blues fans will hope the club do not cash in on their prize asset after Real Madrid boss Zinedine Zidane admitted he has "always appreciated" the Chelsea player. With the London club hit with a Fifa transfer ban preventing them from signing players until the end of January 2020, Chelsea would have to wait to spend any money if they did decide to sell Hazard - though they are appealing against the punishment. It is just over a week since some Chelsea fans called for Sarri's sacking during a narrow win at struggling Cardiff City. Callum Hudson-Odoi also sparkled on just his second league start and N'Golo Kante oozed class as the hosts played with confidence and a swagger they have struggled to produce on a consistent basis under Sarri. With away games at Liverpool and Manchester United to come, the Italian's side still have work to do in the final five matches to finish in the top four. Who will qualify for Europe in various scenarios? West Ham's hopes of finishing in the top seven for the second time in four seasons are fading after a ninth away league defeat. Manuel Pellegrini's debut season in charge of the Hammers has been a story of inconsistency. Lanzini, Aaron Cresswell and Arnautovic all went close before Hazard's second goal ended any hope of a positive result. Chelsea manager Maurizio Sarri, speaking to BBC Sport: "In the first half, we were in full control of the match and I was not happy with the result at the end of the half, we could have scored more. "In the second half, we were in trouble for only 10 minutes but then in the last part of the match we were in control and we deserved to score the second goal. "In the previous match, Eden Hazard has played really well too. He was devastating. When Hazard can play like this, we are lucky." West Ham boss Manuel Pellegrini: "We improved a lot in the second half. They scored that second goal finally and the difference was the first half. "When a player has the quality of Eden Hazard, you know he can make different things. But we could have done better in the way we defended that goal and our play. "We changed things and we had a chance to draw. I saw the personality in the second half but in the first half, no." Eden Hazard has scored 19 goals in all competitions this term - his joint best tally in a season for Chelsea (level with 2014-15). Match ends, Chelsea 2, West Ham United 0. Second Half ends, Chelsea 2, West Ham United 0. Goal! Chelsea 2, West Ham United 0. Eden Hazard (Chelsea) right footed shot from the right side of the box to the bottom left corner. Assisted by Ross Barkley. Attempt saved. Olivier Giroud (Chelsea) left footed shot from a difficult angle on the left is saved in the centre of the goal. Assisted by Ross Barkley. Substitution, Chelsea. Pedro replaces Callum Hudson-Odoi. Kepa Arrizabalaga (Chelsea) is shown the yellow card. Attempt missed. Fabián Balbuena (West Ham United) right footed shot from the centre of the box is too high following a corner. Attempt blocked. Angelo Ogbonna (West Ham United) header from the centre of the box is blocked. Assisted by Robert Snodgrass with a cross. Corner, West Ham United. Conceded by Emerson. Attempt blocked. Marko Arnautovic (West Ham United) header from the centre of the box is blocked. Assisted by Robert Snodgrass with a cross. Attempt missed. César Azpilicueta (Chelsea) right footed shot from a difficult angle on the right is high and wide to the right. Assisted by Eden Hazard. Corner, Chelsea. Conceded by Aaron Cresswell. Attempt missed. Ross Barkley (Chelsea) left footed shot from the left side of the six yard box is close, but misses to the left. Assisted by Callum Hudson-Odoi. Attempt missed. Declan Rice (West Ham United) right footed shot from outside the box misses to the right. Assisted by Felipe Anderson. Corner, Chelsea. Conceded by Angelo Ogbonna. Foul by Fabián Balbuena (West Ham United). Offside, Chelsea. Gonzalo Higuaín tries a through ball, but Callum Hudson-Odoi is caught offside. Attempt blocked. Manuel Lanzini (West Ham United) right footed shot from outside the box is blocked. Assisted by Felipe Anderson. Corner, West Ham United. Conceded by Antonio Rüdiger. Attempt saved. Eden Hazard (Chelsea) right footed shot from the centre of the box is saved in the top centre of the goal. Assisted by Callum Hudson-Odoi. Attempt missed. Aaron Cresswell (West Ham United) left footed shot from the left side of the box is close, but misses to the right. Offside, Chelsea. Kepa Arrizabalaga tries a through ball, but Eden Hazard is caught offside. Attempt missed. Ruben Loftus-Cheek (Chelsea) right footed shot from outside the box is close, but misses to the right. Assisted by Eden Hazard. Attempt saved. Felipe Anderson (West Ham United) right footed shot from outside the box is saved in the bottom right corner. Attempt saved. Ruben Loftus-Cheek (Chelsea) right footed shot from the centre of the box is saved in the top right corner. Assisted by Gonzalo Higuaín. Attempt saved. Manuel Lanzini (West Ham United) right footed shot from the centre of the box is saved in the centre of the goal. Assisted by Marko Arnautovic.